WE ARE SUPER EXCITED TO WELCOME YOU TO LONDONSWEDES' MIDSUMMER HOUSE 2017! After a day in the park or wherever your celebrations have been during the daytime, we are proud to say we have laid hands on one of West London's most epic warehouses for an after party! We are a 15 min cab ride from central London. Over two floors and a big open and bright courtyard you'll be able to enjoy drinks, Swedish Midsummer food, live music and other fun happenings! Our main sponsors for this event is Absolut Vodka that will host a complimentary drink reception between 5:30 pm - 6:30 pm and Clas Ohlson that is dressing the venue with flower arches, amazing garden lighting, fluffy bean bags as well as chocolate fountains and a mobile charging station! STANDARD £25 - GET YOUR TICKETS NOW! SEBJAK / One of Sweden's best DJ's will be flying in just for Midsummer and he knows how to throw in a few of the classic Midsummers songs for sure. The weekend prior to Midsummer he will be performing on the mainstage of Sweden's biggest house festival - SUMMERBURST. Longy and the Feral Child / Live Acoustic set in our little self-made secret garden. The Community with Max Milner / VERY Excited to be having this 5 man band on stage from 10 PM, this will make the place jump! OMYO / Two man band on stage from 8 pm in Studio 2, addicted to their songs! We have sold out all previous years so get your hands on the tickets now before it's too late. 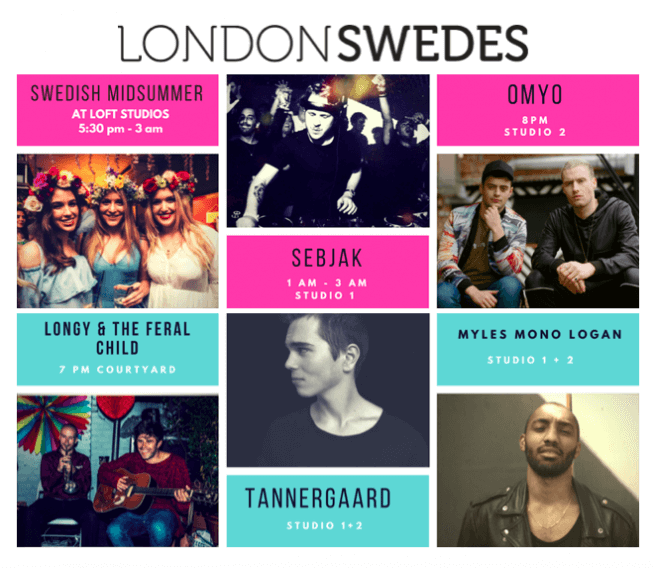 We are the largest community of Swedes in London, both online and offline.